Doris Schöttler-Boll studied with Joseph Beuys. Since 1974, she was active as an independent professional artist, in ways that were what she called "multiperspektivisch," in other words, entailing a multiplicity of perspectives. She never worked only as a lone, individual artist, but always inspired "group processes" at the same time. 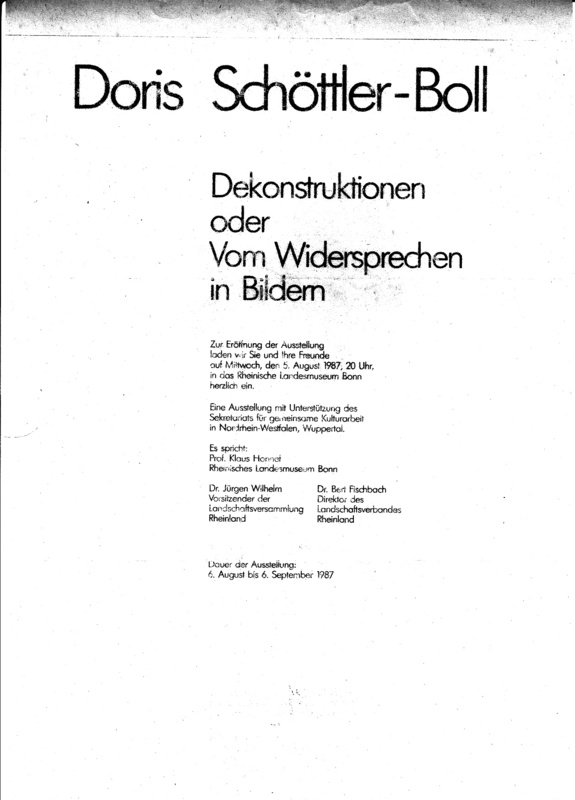 Beuys wrote about her way of working that it is situated beyond rigid aestheticism and one-sided 'politicism' ("jenseits von rigidem Ästhetizismus und einseitigem Politismus") and that it is difficult to value it highly enough. In the mid-1970s, her stay in Paris and the encounter with Derrida became significant for her. It was Derrida, to whom she had written before she was on her way to Paris, that she was compelled to steal the term deconstruction from him because speaking of her visual art works as collages/montages was too reductionist and would fail to grasp the specificity of her way of working. She did not use the term deconstruction as a philosophical concept but in order to describe her concrete aesthetic practice. Her 'signet' DE/KON/STRUKTION which emphasizes the procedures of destruction and construction visually, hints at the tension of the creative processes which were inherent to the way her visual works originated. About the difference between her individual work as an artist and her committed involvement that aimed at a sort of "ART of LIVING" (LEBENsKUNST") in cooperation "with quite heterogenous groups of people," she said that in the first instance it turned around something "beyond calculated concept and pure chance" whereas an idea was always the starting point for that work which happened in group contexts. It was possible that an idea was present subconsciously when she was involved in her own artistist work, but, she said, "in this respect I agree with Godard: I can only begin to speak about this idea when I see it [in the realized work]...."
Derrida wrote about her art works that they are fascinating because they are beautiful and make one think a lot" ("da sie wunderschön sind und viel zu denken geben"). It was this the artist wanted to achieve again and again: To "give" the viewer something she or he "can think about." Stringency, but also beauty. The trace of thoughts in her works - it is not necessarily that of rational, logical thinking, She also warned that an artist does not simply convey thoughts via images. Thoughts are rather present within the images. At the bottom of the image, there is again an image, as Godard said. and I don't see a text / I see an image"
In this regard she distanced herself from every emphatic heightening, every explicit evocation of the subject. To establish a new totality - even by way of reference to the identity of the artist - could diminish the subversion and the desire and make it harmless. The 'subjective trace' (the subject effect) appears only in the act of deconstruction, in the work of difference, the process of de-identification. Which means also / that this, which can be seen, is more than mine. Or: Where I was, IT shall be." While she stole the term deconstruction from Derrida, it was also the way Lacan thought that she felt an affinity to; psychoanalysis always was significant for her. Without illustrating it, she took into account what Lacan said "What we can betray is only our desire...."
As an artist, she remained aware of the social context, the situatedness of the artistic process. Farocki's approach fascinated her because he attempted not to depart from the subjects but from societal structures which become the base, the point of departure and the point of reference for visible forms of behavior. Like Farocki, she wanted to find (or invent) images for these relations. Images which make clear which social mechanisms were causing forms of behavior. When she succeeded to achieve this, it was never in the sense of unfractured, naturalistic mirroring. It was always something subterreanean and in it, tensions resounded. This is why D.E. Sattler speaks of the 'in-between' or the 'interlude' / ZWISCHENZEIT", which resounds in her works: "The depicted moment never was nor will it be. The same is true of the space: It is and it is not. We find ourselves thus / which needs urgently an explanation / in a special time and a special space, neither within nor entirely outside space and time. It is the camera obscura by way of which the dream has nested in the day. The strange location where this is happening is the interspace (Zwischenraum)." When artists were asked what their theme are, she wold answer that the themes of her works originated, if at all, post festum. She also quoted Pierre Macherey who reminded her, when confronted with her works, that it was not simply and only the creative process but "the image itself which is endowed with the quality of an event (das Bild selbst, das Ereignischarakter hat)." According to Klaus Honnef, the artist Doris Schöttler-Boll "tracks down the hidden contradictions within the seductive image worlds of our reality - making them manifest." "The various pictorial fragments which she employs in her collages/montages, transport traces of such meaning as they have in the contexts they hail from, into new contexts. Indeed, the new contexts originate because the original meanings mutually interfere with each other. The glistening 'superficiality' of photographs and their seeming unambiguity unfold a cristalline structure of meaning, a 'space of meaning.' Inside and outside, the conscious and the unconscious, intermingle and from their shadows cristallizes anew the outline of a multi-dimensional reality of experience." Once she said that what mattered to her in her art was also, to set free "the strength to revolt that I still have in me (was ich an Kräften der Revolte noch in mir habe)." This attitude reminds her of something that her friend Michel Pécheux once wrote in a letter to her: "One has (...) the possibility of forms of resistance and revolt in these gaps and fragile spots of imperfection (....)" These gaps and fragile spots are that which is revealed again and again in her collages/montages, in her work of "deconstruction." Doris Schöttler-Boll took part in numerous group exhibitions and she had major solo exhibitions in the Rheinisches Landesmuseum Bonn, the Museum Neuss, the Museum Bochum etc. She curated and organized a series of exhibitions titled Unter einem Himmel (Beneath the same sky) with a focus on gender-related aesthetic questions. Since 9/9/1999, she conceived and organized many essential projects in the Atelierhaus für Kunst, Medien & Kommunikation located in Essen-Steele under the summary title "Persons - Projects - Perspectives." 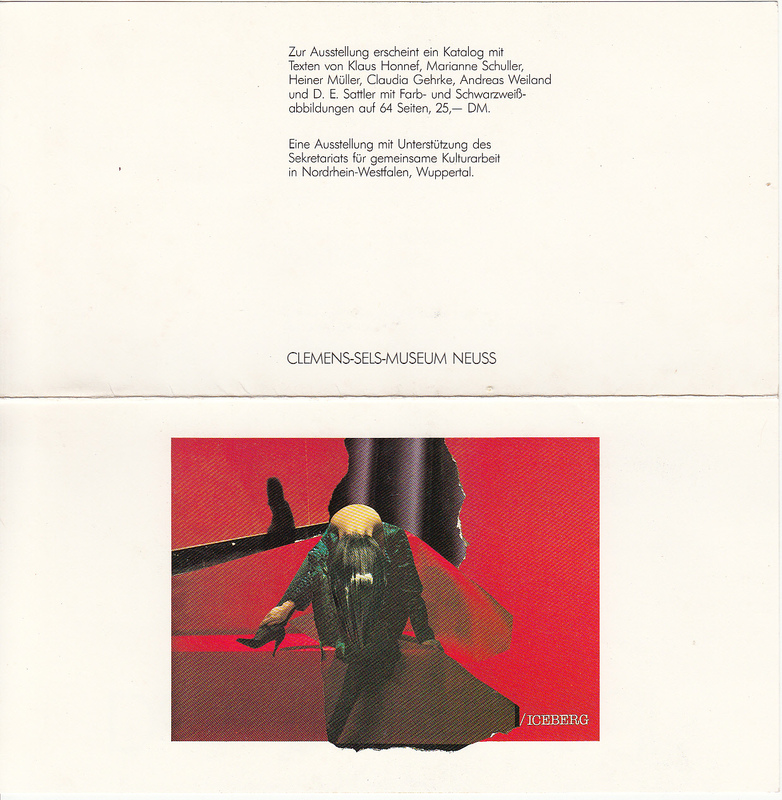 Hansjörg Bay, Friederike Beck, Wolfgang Beilenhoff, Tayfun Belgin, Natalie Binczek, Rita Bischof, Ullrich Bischoff, Wolfgang Blobel, Günther Bose, Robert Bosshard, Rielo Chmielorz, Harald Falkenhagen, Harun Farocki, Rike Felka, Ulrike Filgers, Jürgen Frese, Peter Friese, Toto Frima, Claudia Gehrke, Ingeborg Gerstner, Monika Günther, Thomas Hecken, Marikke Heinz-Hoek, Petra Hengholt, Ute Holl, Nan Hoover, Heiko Idensen, Urs Jaeggi, Birgit Käufer, Peter Kerschgens, Andreas Kopp, Ina Kurz, Marie-Lu Leisch, Jürgen Link, Isolde Loock, Bärbel Messing, Tony Morgan, Inge Morgenroth, Elgar Morgenstern-Hübner, Hartmut Neumann, Gerhard Plumpe, Claudia Richarz, Eu-Nim Ro, Ingrid Roschek, Werner Ruzicka, D.E. Sattler, Matthias Schamp, Christina Schlegel, Norbert Schwontkowski, Thomas Simpfendoerfer, Katharina Sykora, Timm Ulrichs, Rainer Vowe, Andreas Weiland, Tim Weltermann, Niels Werber, Erwin Wiemer, Christoph Wilmer, Anna Zika, and many more.